It's February and it's almost my favorite holiday! For some reason, I have always loved Valentine's Day! I'm so glad that I get to share one of my valentine creations with you today! The whole SSINKspiration team is sharing fun love projects with you today so sit back and enjoy! As you hop along, please be sure to comment and show some love on every blog! We are always excited to hear from our followers! 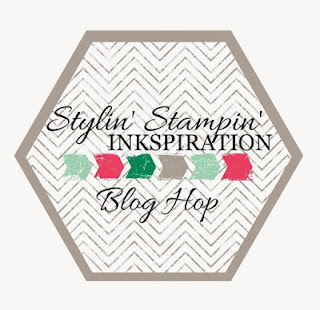 You should have just left stop number 14 on the Stylin' Stampin' INKspiration Blog Hop - Tonya. If so, you are in the right spot. If a link doesn't work or you get off track, you will find the full blog hop lineup below. Today my card was inspired by the FUN Sending Love DSP Stack! I love all of the prints in this stack...and I think you will too. 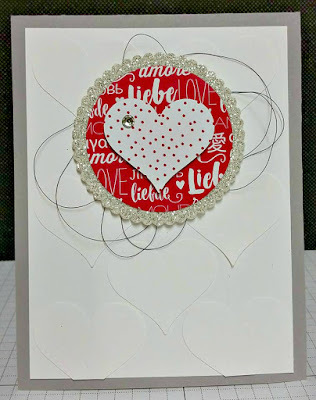 One of my favorite things about my card today is that I used the Sweetheart Punch to create a fun white-on-white background to my card base. Have you ever done this before? Thank you so much for stopping by. Please be sure to continue on with the hop. Next up is Darla! Ooo...Love the background you created with the sweetheart punch! Totally going to try this! oh Kim I just love it!!! simple, clean, and super adorable!! Your cards are always so simple, but perfect and cute! Thanks for sharing the fabulous idea of tone on tone punch backgrounds! Who would have thought?!?!? Nicely done. I like the white on white hearts! Ooh, I love the look of those white hearts on the white background. Stunning card! Great card!! Love the swirleys behind the main heart image- and the glitter paper and white hearts! !